The Falcon TM C bowl is the original Falcon invented by Steve McAlister after noting fine gold in the sand/slimestream of gravel mines in British Columbia. A prototype was tested in 1981. By 1986 the first commercial Falcon TM was operational and patented in 1989 (US #4,824,431)[152-155]. Although largely eclipsed by later versions, experiments continue to deepen understanding of the device  –www.concentrators.net. The Falcon TM C bowl has a very smooth inner wall. Itdiffers fundamentally radically from the Knelson TM C bowl by NOT having riffles or elutriation water and so lack spores and has no water jacket. Rather than trapping gold in a fluidised bed maintained by water injection, theFalcon TM C bowl uses high apparent gravity to induce density stratification in a thin flowing film. The feed is screened at say 2mm and fed either dry or as slurry from above via a feed pipe that delivers the feed in an ‘impeller zone’ near the bottom of the bowl. Here the feed is flung tangentially to the foot of the wall by the high apparent gravity of the spinning bowl plus the action of the impeller. The impeller reduces the energy needed to rotate the bowl and helps to drive the slurry. 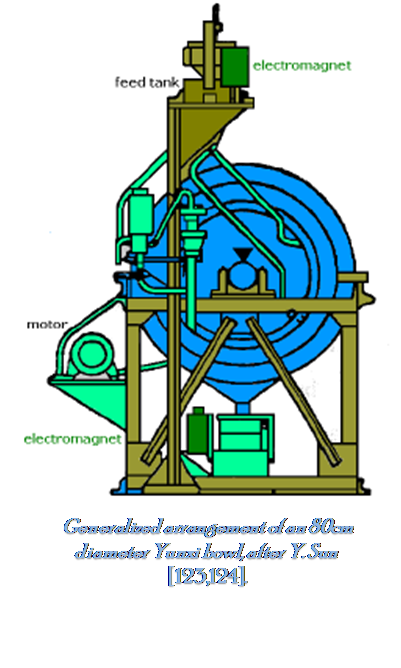 Rotation is very fast to attain 20 to 300g .The feed is driven by the high apparent gravity up the lower part of the centrifuge is gently conical, tapering outwards at 8-14°, and termed the ‘migration zone’. Within this zone, the flowing film becomes highly stratified with the gold against the wall and the lighter particles and liquid forming a superficial layer. Rising up the out wardly tapering wall of the migration zone, the flowing film enters the cylindrical upper part of the centrifuge termed the ‘retention zone’. Gold arriving in the retention zone displace lighter particles that are liberated into the jacket-like discharge chamber to be ejected as tailings. Since 1990, the device is fitted with an AutoPAC that controls the rpm of the rotor and feed valve and automates a 90-minute cycle time interrupted by a mere 30-40 seconds for automatic water flushing of concentrate down the hollow drive shaft.The percentage recovery of very fine gold is high, but the concentration ratio is low. Therefore the concentrate is not rich enough for smelting and the device is best used as a pre-concentrator and for upgrading tailings. tailings with an upgrading ratio of 10 . Using the SL-600 Separator on cassiterite slimes, the most suitable size range for cassiterite recovery was 3-37 µm [125, 127]. The author has not seen a description of how the Yunxi bowl operates. Tin ore is first screened to <74 μ and a suitable slurry prepared. The slurry is gravity fed into the rotating Yunxi bowl and the heavies are slammed on the inside wall of the centrifuge. The amount of enhanced gravity is 102 g,51g and 30g for bowls of diameters of 40cm, 80cm and1.6m respectively. The heavies remain on the bowl wall as concentrateto await batch discharge, while the lighter particles are ejected as a continuous discharge of tailings. 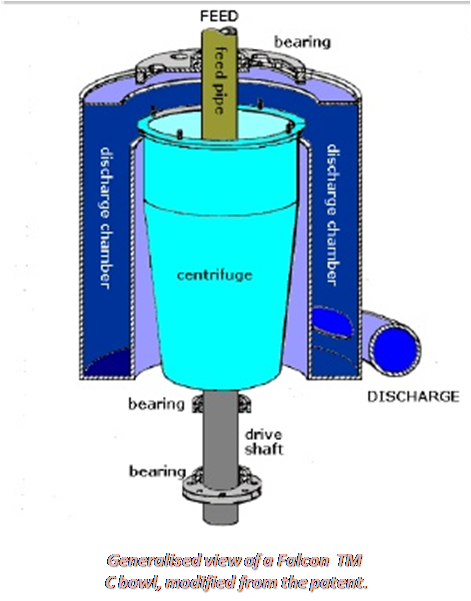 After a period, the device is stopped for batch discharge of concentrate. The stopping, discharging and restarting are automatically controlled.